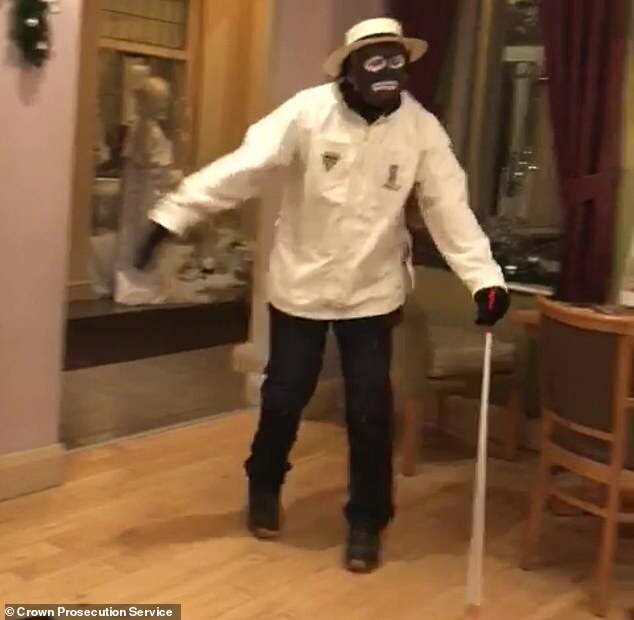 A 62-year-old maintenance man blacked up and performed a shocking racist black-and-white-minstrel routine aimed at a black colleague, in order to humiliate her during a works Christmas party. Brian Davies, from Barry in Wales, was today fined £120 plus costs of £300 after being found guilty of racially aggravated harassment and using threatening or abusive behaviour at the party at Coopers Carvery in Ely, Cardiff, on December 19. Cardiff Magistrates’ Court heard catering manager Loretta Doyley was ‘singled out’ when Davies directed the black and white minstrel song ‘Mammy’ at her, leaving her wishing ‘the ground would open up’. 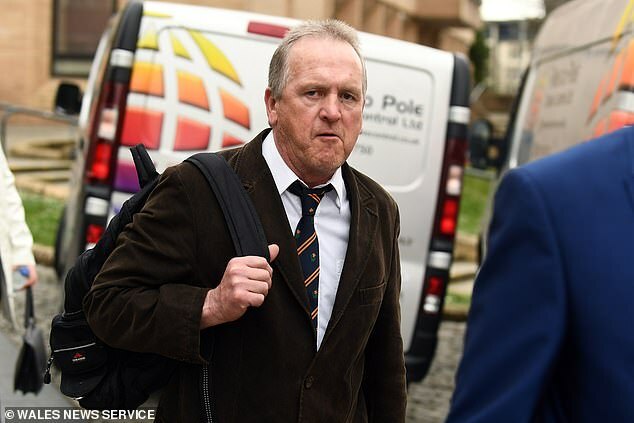 Mr Reed said Davies had been insistent Miss Doyley should attend the Christmas party – for employees of private healthcare firm the Priory Group – telling her he had bought her a ‘present’ after she had initially showed ‘reluctance’ to go. 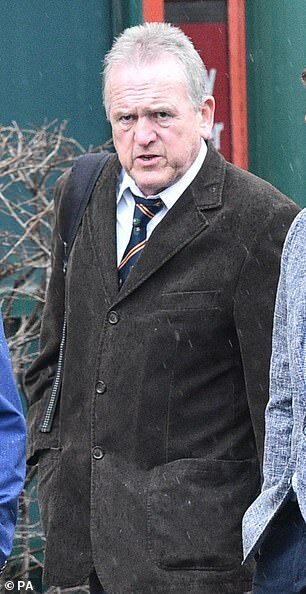 At the party, the Priory colleagues were ‘having fun, playing games and doing pub quizzes’, the court heard, before Davies left with a friend, taking a bag and white cane. 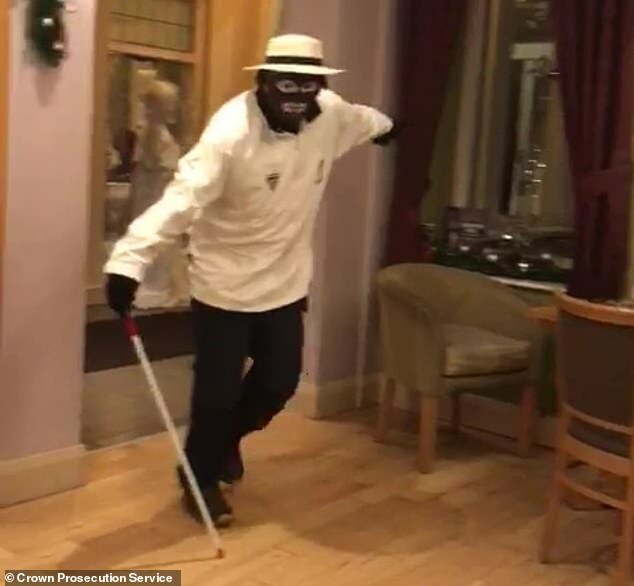 Footage of the incident was played in court, showing Davies with his face blackened and wearing a boater hat, white shirt and black gloves, and swinging a cane. He then sang and danced his way around a table of colleagues, singing Mammy as well as Swanee and Old Man River, directing much of his performance at Miss Doyley. The performance bore resemblance to the 1930s Jewish-American singer Al Jolson who often performed in blackface. Mr Reed said the incident left Miss Doyley ‘distressed’, saying she had been off work for ‘some time’ and was receiving medication. Miss Doyley broke down in tears while telling the court via video link how she felt ‘humiliated’ during the stunt. She said: ‘Because everyone was laughing I started laughing too. But I was really embarrassed. Miss Doyley said colleagues were taking photographs and video clips of Mr Davies and some even posed for selfies with him. She said she recognised the song as ‘Mammy’ sung by black and white minstrels, saying she knew it ‘was deemed a racist song’. She said: ‘Brian told a colleague: ‘Don’t forget your phone, you don’t want to miss this’ before he left. About 15 or 20 minutes later I heard a roar of laughter. ‘The next thing, there was a hand in my left shoulder and it was in a black glove. ‘I turned round and saw Brian had painted his face black and there were bits around his eyes and mouth still white. Miss Doyley turned to her fellow colleagues from the Priory Group, telling them: ‘This is not funny’ before leaving the pub in tears. She was supported by a number of her colleagues with one witness telling her that Davies’ actions were ‘disgusting’ and ‘should never have happened’. Directing further comments at Davies, Miss Doyley said: ‘You were mocking me and you humiliated me in front of all the people. ‘Everyone was laughing and I just saw them laughing at me because your actions were directed at me. ‘You lied to me to get me there so for me you orchestrated all that.. It was all planned. Despite ‘crying herself to sleep’, Miss Doyley returned to work the next day. She was supported by some colleagues but was told by another not to ‘get Brian in trouble’. 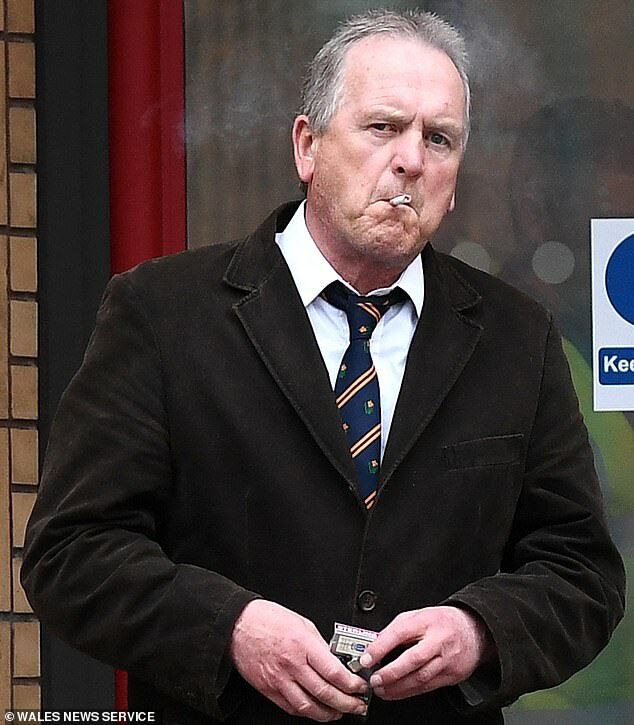 The court heard Davies was interviewed by police after Miss Doyley made a complaint, and in interview he stated he had no intention of causing her any distress and denied his behaviour was abusive. Upon arrest at his home, he told police: ‘Are you serious, I only dressed up’. At his interview Davies denied that this was racially aggravated and said he was left ‘dumbfounded’ by the allegations. Giving evidence at his trial today, Davies said he thought he had a ‘fantastic relationship’ with Mrs Doyley. He said: ‘She was a really dear friend of mine. ‘I only wanted her to be there because she was one of us, I didn’t want her to miss a night out. Davies says he didn’t realise Mrs Doyley was upset and was ‘devastated’ when he found out she was. Asked about the Black and White Minstrel Show, Davies insisted that he didn’t realise the show had racist connotations. He said: ‘I just thought it was a show with songs and dance that that was on Sunday nights that used to be popular. ‘I never knew it was racist. I’ve never heard any criticism.. My mother and father used to enjoy it. Magistrate Ken Horseman said: ‘You made a concerted effort to ensure that Mrs Doyley attended the event. ‘We have heard evidence from Mrs Doyley and we have seen video footage of the event. ‘We find it to be abusive and racially aggravated. 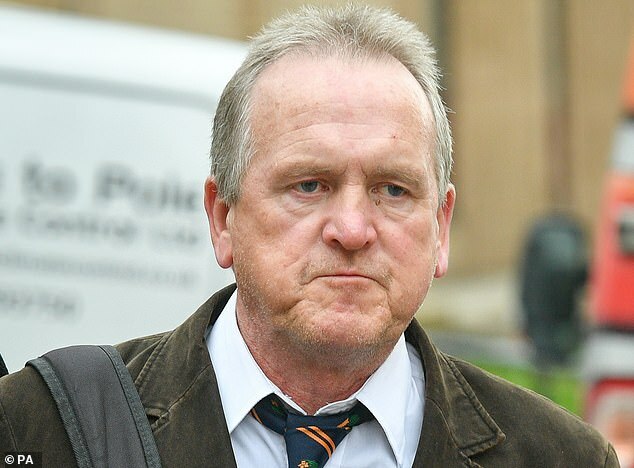 Davies was fined £120 and ordered to pay £300 in costs as well as a £30 victim surcharge.